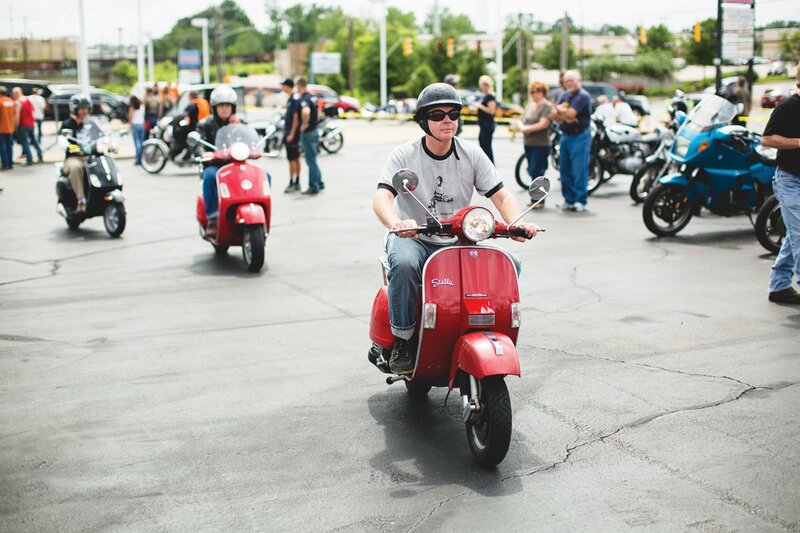 Scooter enthusiasts and vintage motorcycle aficionados will be in Northside this weekend for the annual Motoberfest Rally, hosted by the Cincinnati Cafe Racer club. Participants are invited to take out their most interesting rides, meet fellow riders and make new friends as they enjoy regional music and an unusual art show featuring painted helmets. Friday: Motoberfest kicks off with a short urban ride called the “Twilight Landmark Tour,” followed by a laid-back social mixer on the patio of the Northside Yacht Club, 4231 Spring Grove Ave.
Saturday: Riders can start their morning with an informal meet-up and cup of joe at 8 a.m. at Fuel Coffee Shop, 2726 Riverside Drive. At 10 a.m. the action moves to the Christian Moerlein Tap Room in Over-the-Rhine. The group ride departs at 1 p.m. and returns to Christian Moerlein around 4:30 p.m., with festivities into the evening hours. The Biltwell ART & MOTO, starting at 7 p.m., features an auction of one-of-a-kind helmets painted by local artists. Other evening offerings include a bike show, vendors, music, food, drink and raffles. Proceeds will benefit LifeCenter, the local organ donor network, which encourages and coordinates the donation of human organs and tissues for transplantation. Motoberfest Rally also encourages motorists of all kinds to register themselves as organ donors.